Founded in 2001，Shanghai Tianbao Fastener Manufacturing Co., Ltd. has grown to be one of the largest fastener manufacturer and exporter in China. With over 10 years’experience, we explore the market in 33 countries and regions in the world , with over 150 variety customers, total export value Usd 50 million in 2010. Socket hex bolts (DIN912), T-Nuts, Washers (DIN125,DIN127,DIN6916), Thread rods (DIN975), Machine screws, Wood screws, Drywall screws and Chipboard screws. The strength grades range: CLASS 6，CLASS 8，CLASS 10，2H，HV10 for Nuts, CLASS 4.8，CLASS 6.8,CLASS 8.8,CLASS 10.9,HV 10.9 for bolts. We provide surface finish: black oxide, zinc plate, phosphate, hot dip galvanize, Dacromet and others. The raw steel material are SWRCH35K,10B21,,ML08AL,Q195,Q235,Q215,40Cr. We could offer full range of products, various products with customized headmark, label, package and non-standard products, so it could enable you one-stop shopping. We have two factories –Shanghai Tianbao at Shanghai and Lengjiang Tianbao in Hunan province. Established in 2001, Shanghai Tianbao factory has a 20,000㎡ plant specialized in fastener producing , adjacent to China most advanced Bao-steel manufacturing base, total assets of 120 million RMB Yuan, above 250 employees, over 50 technical personnel, current annual product capacity 30,000 tons, heat-treatment 1,350 tons monthly, annealing treatment 800 tons monthly. 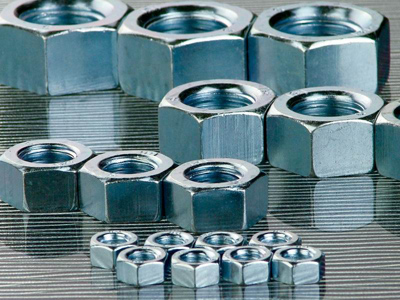 We are accredited to ISO9001:2000 quality management system and TS-16949 Automotive fastener certificate. The facility : 4 sets imported well type spheroidizing annealing furnace, 30 sets high-speed, high-precision nuts cold header from Taiwan, 1 set cold header from Japan, 35 sets tapping machine, 17 sets bolts cold former, 7 sets screw rolling machine, 2 sets heat-treatment furnace, 8 sets draw bench. The testing instruments: tensile strength tester, hardness tester, rusty resistant tester, Metallographical equipments and impactive test machine. registered capital 160 million, over 400 employees, annual productivity 150,000 tons. The facility : 31 sets nuts cold header from Taiwan, 30 sets tapping machines, 53 sets bolts cold former including 8 sets from Taiwan, 26 sets screw rolling machine, 9 sets draw bench, 3 sets annealing furnace, 6 sets heat-treatment furnace,.1 zinc plating line. In the near future by end of 2013, in Chongming Island industry base in north Shanghai , the newly built 135,000㎡ plant will put into operation , it boast the most updated, largest Fastener Processing Center in China.